This post is a little late, but better late than never, I suppose! Sandi (whose crafty/teaching/travel blog is here!) and I got together last week and baked a cake! It was a great way to spend the day, just chatting, catching up, and baking a fabulous dessert. Now, the original recipe, I found here, and the only thing I really changed was the type of cherries that we used. I hate the taste of maraschino cherries. They are so sweet, and the flavour can be completely overpowering. I had some fresh cherries in the fridge, and decided to swap out the maraschino cherries for the fresh cherries. 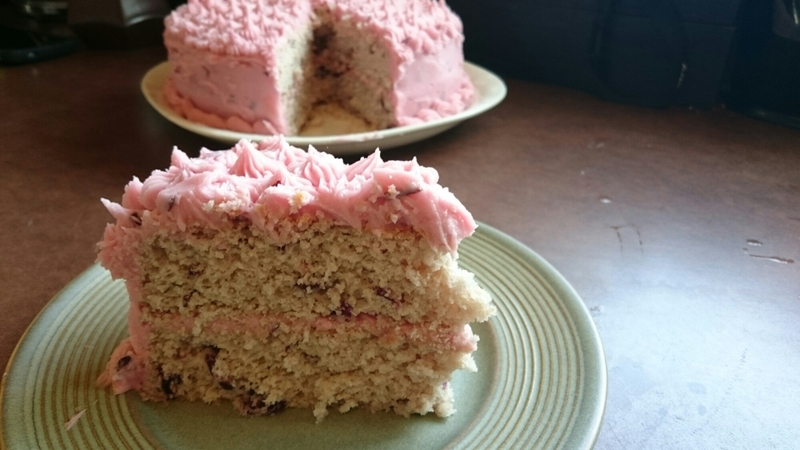 While the cherry isn’t as flavour-forward in the cake, they are in the icing, which is what I was going for. I also used regular all-purpose flour instead of cake flour. I never use cake flour, because I never see the need to buy cake flour when all-purpose works just as well. If I ever open up a bakery, I may consider it, but right now, all-purpose is the flour for me. The only thing I would change if I made the cake again would be to add some almond extract into the cake. 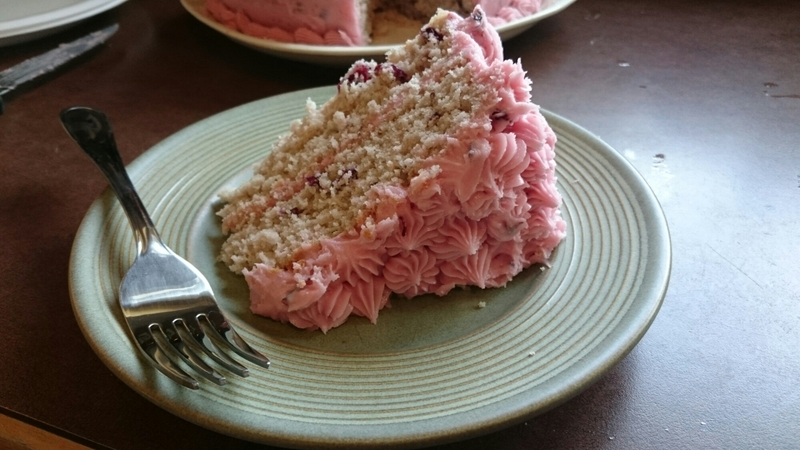 The recipe only calls for almond extract in the icing, and when I tasted the cake it was good, but I found myself searching for the almond flavour more. I am an almond lover, and it definitely needed the addition of some almond extract in the cake batter. I have included this change in the recipe below. Preheat the oven to 350°F. Grease and flour two 9 inch cake pans, or brush with miracle cake release. Fasten bake-even strips (strips of towel dampened with water) with safety pins around cake pans. Chop cherries for cake, and set aside. Take about 10-12 cherries, pit them, and with 1 tbsp. water, puree in a blender until smooth. Mix together the flour, sugar, baking powder and salt in the bowl of a mixer. Add in the butter, milk, and cherry puree. Beat on medium for 2 minutes, and fold in the chopped cherries into the batter. Add egg whites and beat until batter is smooth, 1-2 minutes. Divide the batter between the cake pans. Bake for 25-30 minutes, until a toothpick inserted in the centre of the cake comes out clean. Allow the cakes to cool in the pans for about 5 minutes, then turn out onto wire racks to cool completely. For the buttercream, in the bowl of a mixer, whip the butter for 2-3 minutes until light and fluffy. Add in the icing sugar, cherry puree, cream or milk, and almond extract, and 3-4 drops of food colouring. Beat on low for 2-3 minutes, or until the icing comes together in a smooth mixture. To prepare the cake, place one of the cooled layers on a cake stand or serving platter. With an icing spatula, spread about 1/3 of the icing on top of the first layer. Place the second layer on top of the icing, and press down lightly. 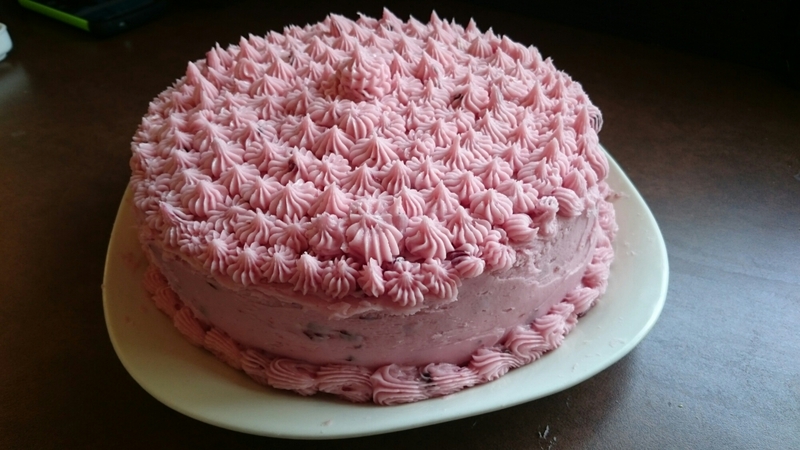 Ice the sides and top of the cake with the rest of the icing, using decorative icing tips if desired. Slice, and serve! This past week, Paul and I bought some blackberries to experiment with some of our wedding cocktails. After all of our experiments, I had a bunch of blackberries left over. Considering the past couple days have been nothing but rich Devil’s Food Cake, I wanted something to cut the richness of the chocolate. For me, berries are just the thing. However, I had blackberries left over, but not enough to make a full blackberry dessert. When I went to the store to grab a few things for dinner, they had a great sale on bags of cherries. 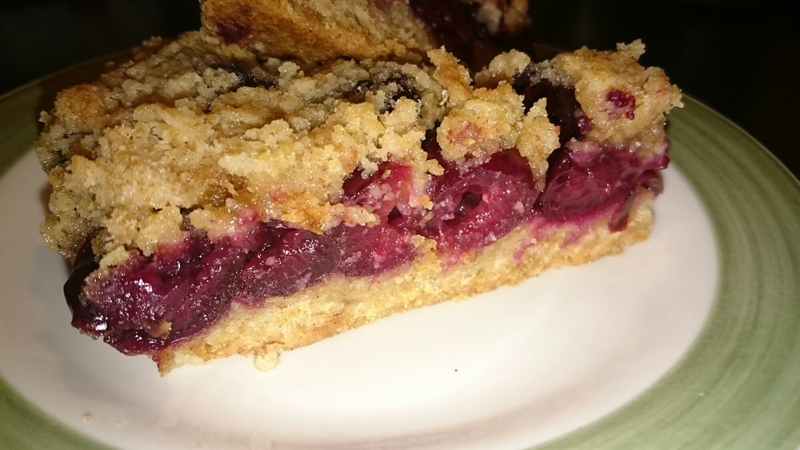 I took to the internet, and found a tantalizing recipe for Plum Crumble Bars. I decided to change it up a bit and exchange the plums for the blackberries and the cherries I bought. They were fairly easy to make, the longest thing I had to do to prepare the recipe was pit the cherries. Here’s to a long, hot summer filled with all kinds of delicious fruit filled recipes! Preheat oven to 375°F. Spray a 9 x 13 pan with cooking spray. Rinse berries. Pit and halve cherries, and set aside. In a large bowl, combine the sugars, baking powder, flour, and spices. Whisk to combine. Dice the butter into small cubes, and with a pastry blender, cut in the butter to the flour mixture. Once the mixture resembles coarse crumbs, stir in the egg. Press ¾ of the mixture into the bottom of the pan and press firmly. Spread the blackberries and cherries over the crust in an even layer. Sprinkle the remaining crumble mixture over the berries. 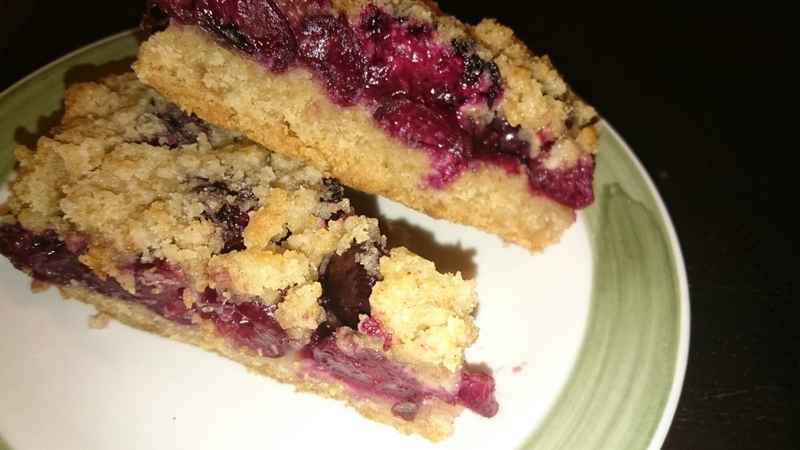 Bake for 30-35 minutes, until crumble on top is golden brown and berries are bubbling. Cool in pan completely before slicing and serving.